The retail cash drawer evolved from a basic wooden box with a bell to a metal box to a secure, intelligent device that keeps track of currency amounts by cashier and transaction and helps retailers improve their operations. One of the biggest benefits of intelligent drawers is loss prevention. Cash loss, or shrinkage, is an ongoing major challenge for retailers. In 2017, it amounted to 2 percent of retail sales globally, or $100 billion. Common causes are errors in pricing, mistakes in manually making change at cash registers and outright theft. It’s not an easy problem to solve because even alert, honest retail employees can make mistakes. At APG Cash Drawer, we talk to retailers about their cash management challenges so we can support their businesses and address pain points. This is one of the reasons APG developed the SMARTtill® Intelligent Cash Drawer. The SMARTtill® Solution has the ability to reconcile the drawer/till balance to the POS application’s transaction log after every transaction. The drawer detects the number of bills by denomination – ones, fives, 10s, 20s and 100s – as well as coins – pennies, nickels, dimes and quarters. In addition to U.S. dollars, the SMARTtill® Solution can manage other currencies, including Euros and British Pounds. The system rapidly calculates changes in the till, letting retailers know exactly how much money is in a drawer at all times. If a mistake in making change occurs, an alert can be immediately sent to the cashier or back office, allowing the retailer to correct the error before the customer walks out. Depending on the retailer’s operation, the drawer also can send an instant alert to the video team when a discrepancy takes place. The loss prevention team can look at the exact date and time stamp of the discrepancy in real time, eliminating the need to sift through hours of store POS video. Discrepancy alerts have a huge impact on cash loss prevention by addressing one of the most common causes of shrinkage. Besides loss prevention, intelligent cash drawers also improve customer satisfaction. Traditionally, when a discrepancy occurs, the error may go unnoticed until the end of the shift when the cash is counted. In some cases, customers may walk back into a store saying they were given the wrong change. This causes awkwardness between store staff and customers when there is no way to prove the customer is right. 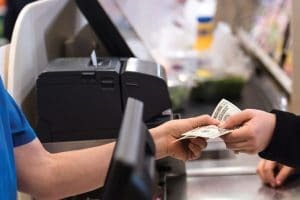 Some retailers may take customers at their word to avoid confrontation while others may ask the customer to come back at the end of the shift or even the next day after they’ve had a chance to do a cash count, neither of which is ideal. These types of situations are reduced with an intelligent drawer such as the SMARTtill® Solution, thanks to its real-time tracking capability. Another major benefit of intelligent cash drawers is staff productivity. Retail managers and employees are always pressed for time. Manual cash counts are a big time drain, since they usually take place at the end of each shift and then again at the end of the day. Eliminating cash counts saves hours every day that staff can dedicate to other tasks, such as helping customers with questions at the point of decision. 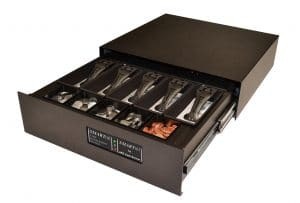 Intelligent cash drawers can also help store managers follow till compliancy or best practices, by alerting managers in the backroom when a drawer needs to have a cash pull or topped off. Without this capability, top-offs and lifts often happen in the middle of a transaction, delaying the transaction and frustrating other customers in line. Intelligent cash drawers also deliver peace of mind. Owners and managers don’t have to worry about cash shrinkage – or certainly not as much as they would without them. When lane/drawer accountability management models are used, cashiers know that if a discrepancy occurs, they won’t be falsely blamed because of the drawer’s real-time, by lane, by transaction, by cashier tracking capability. That is a win for everyone involved. To learn more about SMARTtill® Cash Management Solution, click here.